So last Thursday am, Gizmo Joe and I began our GSMNP AT hike from the parking area just above the Fontana Dam Shelter around 5:20 am. We stayed at a hotel in Robbinsville, NC the night before and got approximately 3.5 hours of rest before waking up and heading to the trail. We donned our headlights to begin our hike down the paved drive and stopped off at the visitor center at the dam to take advantage of the last “privy” with running water, and electricity. 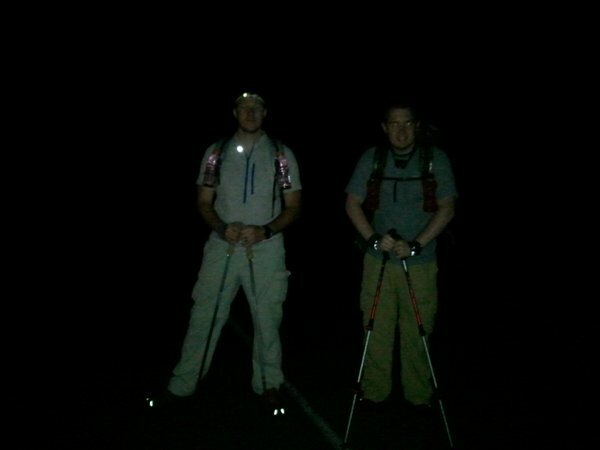 Then, around 6 am we began crossing over the dam and making our way along the AT and into the Great Smoky Mountains National Park. As you may already know, this hike would mark a few milestones for Gizmo Joe and I. This was our first “SUL” hike. This hike would consists of 3 of our biggest hiking days, back to back. Our plan was simple. We would hike strong and steady for about 2 hours, and then stop and pull our shoes off. Relax for a minute and have a snack. Take in the views. And enjoy our hike. By 8 am, 2 hours after we actually began our hike over the Fontana Dam, we were sitting 4.7 miles down the trail, atop Shuckstack mountain…doing all of those things that I just listed! After about a 20 minute rest, we loaded back up and continued on down the trail. A couple of miles later we came to Camp Site # 113 (the only legal camp site on the AT through the GSMNP) and decided to stop in for a little bit to refill our water bottles. We were both using the Sawyer Squeeze water filter system on this trip, and I will just go ahead and tell you, I really came to like this system on this trip. I will admit that the bottles can be hard to fill if the water is anything but running, but with a little effort, and a Ziploc bag, it will still work just fine. At this particular spot though, there was a convenient little pipe sticking out of the stream over a rock which allowed water to be easily collected! After collecting our water we decided to keep moving on. There was still about 17 miles left for us to cover before we reached our destination for the night, but we were feeling pretty well at this point, and were full of excitement as we continued on down the trail. Once I got back up to the top, lowered my pack down and grabbed the Ziploc bag I headed back down the trail to the water source. Once there I quickly filled my 2L Sawyer bag and then trudged back up the hill to filter the water into my water bottles. Just as I was nearing the top I noticed Joe coming down, so he decided to just leave his pack at the shelter with me and also carried his Ziploc and his Sawyer bottle down to the water source. 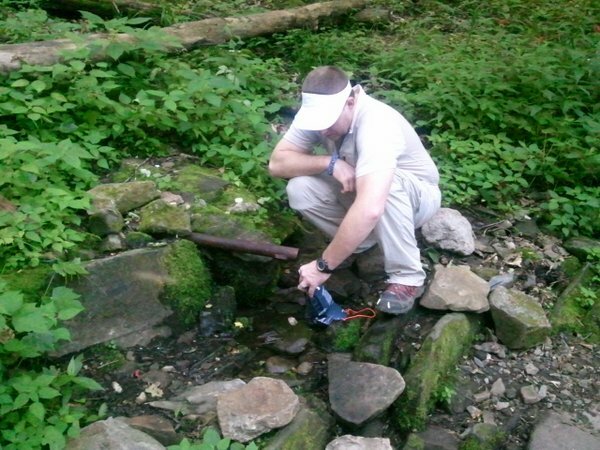 As I was filtering my water a hiker strolled in from the north along the AT. He was only carrying a water bottle and a folding chair. After talking with him for a bit he told me that he was staying with a group at Spence Field Shelter, about 3 miles up the trail. However, he just wanted to get out a little more since it was still early in the day. We talked for a while and Joe made his way back up after a little bit. Soon after, I decided to go ahead and hike on a little farther so I told Joe that I would wait for him again at Spence Field Shelter. And hour later I reached the side trail that wound its way from the AT and too Spence Field Shelter. Rather than hike the trail to the shelter, I simply sat down and waited for Joe to arrive at the trail head. Again, as usual, I pulled my shoes off to let my feet breathe and also had a quick snack… our last big hike was coming up next! He seemed to be ok at the time, so he rested for a bit and then we began our hike towards the famous Rocky Top! As I made it to the top of Thunderhead, I came across a member of the “Sweat Crew” sitting atop Thunderhead. He looked tired and a little worn out, but was relaxing at the moment, having a smoke. I briefly talked with him and then made my way down the mountain. I hiked on a little farther. I pushed up a small climb and when I got to the top I looked down a long straight-a-way on the trail and still did not see any white blazes… I sat down a moment, pulled out the map again and compared the elevations with the read out on my watch. It did not add up for sure, and I couldn’t be sure what to trust. In the past, I have found the “maps” to be a bit inconsistent at times, and the same with the altimeter readings on my watch. So, I sat there for a bit and thought about it, and waited for Joe to come up. After a couple of minutes, I decided to backtrack a bit to see if I either came across a white blaze, or Joe. A few tenths of a mile I ran into Joe and quickly asked him if he had noticed any recent white blazes, to which he replied not recently. So, at this point we both decided to continue backtracking until we found a white blaze, or camp back to the “Sweat Crew” camp. As we continued to push on we were now getting ready to get to camp. I think that the brief feeling of being “lost” gave us a little bit of a scare and we knew that we were close to the end of the day’s hike, so we were ready for it to be done at this point. Once I arrived at Sugar Tree Gap, which was 1.1 miles from our destination, Derrick Knob Shelter I waited for Joe. When he got there, he told me that his stomach was really messing with him and he was feeling bad. We sat down for a bit and I gave him some of the Pepto-Bismol out of my FAK. We sat there a little longer and then I told him I was going to push on to the shelter and I would meet him there. About 30 minutes later I was at the shelter. There was a section hiker and 2 other weekend hikers at the shelter when I arrived. I spoke with them briefly and let them know that my buddy was coming up soon and did not feel well. I then asked about the water source, unpacked my pack and grabbed my cook pot and my 2L Sawyer bag and headed down the side trail to collect water. 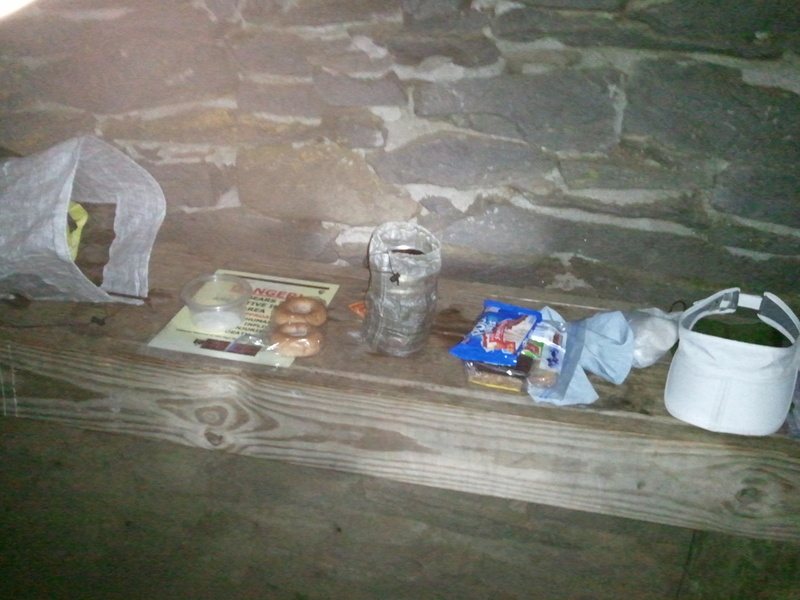 When I got back up to the shelter I began to boil my water and get my bedding ready. Soon after Joe hiked in. He still wasn’t feeling well. He refilled his water and got his things unpacked, but couldn’t bring himself to eat anything. Later on in the night I gave him my last 2 Pepto-Bismol tablets and then we climbed into our beds. The trail that we decided on turned out to be quite sketchy, the same as the trail the day before. We had a hard time finding any white blazes, and I began wondering if the first “blaze” we saw was really a blaze… But then a short ways farther, we came to a trail sign that assured us we were on the right trail. However, as the sun began to make its way up and over the mountain tops, Joe was getting worse and worse. A couple of times he had to stop and throw up. Each time afterwards he felt a little better for about 10 minutes, but then it came upon him just a little worse. By the time that we were only a few short miles into the trail for the day, he was to the point that he was needing to stop frequently to rest, and the times that he was hiking he was too fatigued to get very far very fast. About 4.5 miles into the day’s hike I took the food bag from Joe’s pack and put it into my own pack. Then quickly after we made it to Siler’s Bald Shelter. Once here he laid down on one of the benches and rested for about 25 minutes. 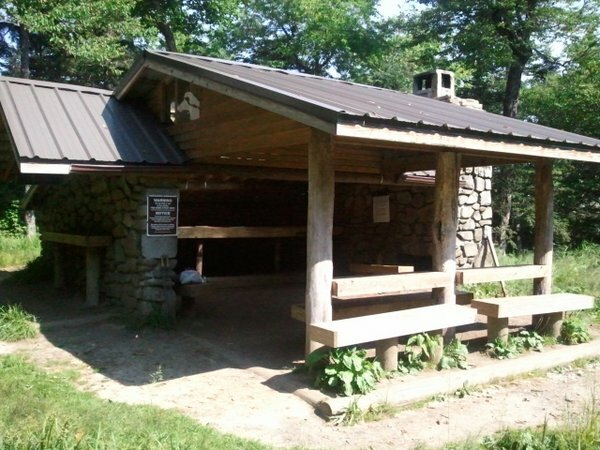 The water source at Siler’s Bald was only very shallow puddles and I knew that Double Springs Shelter was only 1.7 miles farther down the trail. After Joe rested for a bit, we pushed on to the next shelter. By this time, Joe appeared to be doing a little better. I figure that the Emergen-C had kicked in a little, as well, the power nap he had helped him to regain some energy. Once we arrived at Double Springs Shelter he sat down while I went and filled our water bottles. When I made it back up with the water he informed me that he was able to get cellular reception, so I got in touch with my wife and let her know to meet us at Clingman’s Dome in another 2 hours. We had decided that Joe was in no condition to continue hiking, and at this point in time, we were well behind schedule to get in the planned 28+ miles this day. After hanging out at Double Springs for a little while longer we shouldered our packs and continued on. After about another 1.5 miles or so I told Joe that I was going to push on ahead and meet up with my wife and kids and that we would wait on him at the tower on top of Clingman’s Dome. Around 1 pm we were all back at the tower and heading down the steep, 0.5 mile hike down to the parking lot at Clingman’s Dome. Once we got back to our truck we headed back into town and Joe’s wife came and picked him up from our hotel. Beginning my hike out, I figured that it would take me approximately 2 hours or a little more to hike to Mt Collins Shelter. However, an hour and a half later I was standing at the trail sign which informed me that Mt Collins Shelter was 0.5 miles down a side trail. Being that I had arrived a full 30 minutes sooner than expected, and I still had plenty of time before my wife would meet me at Newfound Gap, I decided to head to the shelter. After spending some time at the shelter, doing a little video and eating a snack I shouldered my pack again and headed back up to the AT to continue on with my hike to Newfound Gap. This entry was posted in Gear, Trip Report and tagged Appalachian Trail, AT, Backpacking, Camp Site 113, Clingmans Dome, Derrick Knob Shelter, Double Springs Shelter, Great Smoky Mountains national park, GSMNP, Hiking, Mollies Ridge Shelter, Mt Collins Shelter, Newfound gap, Rocky Top, Shuckstack, Silers Bald Shelter, SUL, Super-UltraLight, Thunderhead Mountain. Bookmark the permalink. The bear incident sounded a bit scary. Glad things turned out well in the end, and even though you didn’t make the big miles, you’ve saved something for another day. Did all the kit work OK, and did you use everything? Stay safe, walk far, and weigh EVERYTHING. The bear was a gasp for a second, until I realized that it was not too interested in me at all…but I did feel better once Joe came around the corner! Really enjoyed the write up and videos. I was wondering if you could elaborate, through video or picture step-by-step, on your water bottle shoulder strap set up. How is it put together? Did you do it or buy it. I would love to know so I can try this out. Nice post. I love that section of the trail and wish I got back east more often to hike in that area. RE: trail right of way – I’ve always deferred to those going up hill. That’s what I was taught by my Scoutmaster years ago and it has always made sense to me. When I’m going down hill, I don’t mind an unexpected stop to let someone pass. When I’m going up hill, I want to get into a rhythm and don’t want to stop unexpectedly. Thanks Tag. That is a really nice area and am looking forward to being back up there this weekend! As far as the ROW…that is interesting. I was never in the Scouts. My son got into it this year, at least until baseball came back up… Anyway, that is good to know that this is what they teach in Scouts. Thanks for passing it along, and thanks for stopping by. Hey there Stick, I was two days behind you on the same hike, Fontana to Davenport over 3 nights and saw your entry in the Mollies Ridge Log Book. I’ve run across your blog a couple of times before so it was cool to see that you were just up ahead, maybe I’ll run across you on the trail sometime. BTW I hear you on the heat and the snoring. Great, great trip report. Reading about your trip and viewing the pictures as I read, drew me into the story…but watching your videos after reading about the trip allowed me the virtual opportunity to hike with you and see what you see, as you see it. This is the kind of thing that fuels my passion for backpacking the AT when I don’t have the opportunity or time to hike when I want… or need to. You purged an execptional amount of weight from your normal pack weight to do what I would consider an insane amount of miles hiked per day. Just thinking about hiking 20+ miles per day makes my feet and knees ache just thinking about it, so this is why I took a particular interest in your hike. I am trimming excess weight from my pack and am moving towards UL, so that I can again experience the true value of backpacing in the mountains. Obviously, less pack weight means less pain and the ability to trek longer distances, to see more, and to enjoying more….dooh!…just had a Homer Simpson moment. Anyway, I just want to say THANK YOU for what you do. Wow…well said, and thanks for the comment. I really appreciate the thoughtful, and kind words. Thanks for the videos, I found the blog via YouTube and have been following your videos as well as a few 2012 AT Thru-Hikers. I also enjoyed your recent effort in the Smokies. I’m glad Joe is well and its just bad luck. Years ago, carrying a heavy pack, I turned my ankle so badly my buddies had to carry my equipment 10 miles to the car, while I hobbled all the way there. We’ve experienced stomach flu, altitude sickness, exhaustion, dehydration and hypothermia. You deal with it smartly, make good decisions for the group, have a great time and come away smarter. There’s always another hike coming. Also, I just have to weigh in on the right-of-way discussion you brought up in the Smokies. Here in the Northwest, many of our day hikes are Cascade summit hikes. You’ve got it right. Unless there is an obstruction, like a narrow, natural series of steps where someone is coming up, the downhill hiker generally has the right of way. Downhill hikers are usually moving quickly and uphillers are happy, sometimes very happy to step to the side and say hello. No rules, it just seems natural. Thanks for the videos, I’ve really enjoyed the reviews as I continually lighten my own pack. Best of luck at Mt. Rainier, I hope that’s still in your long term plans. Like the John Muir, it’s a classic thru hike, only on one of the greatest mountains in America. Thanks for following my YouTube videos and my blog, as well as for the kind words. I appreciate it. Sickness and injury on the trail is a bad thing, but sometimes it just happens, and IMO, these are the things that we need to be prepared for. And I agree with you totally, you deal with it (hopefully) smarter and learn something from it. Thanks for your comments on ROW also. It has been interesting to hear so many different peoples thought on this matter. About the Frontier Pro – I was also going to bring a chemical treatment. Im trying to go on the cheap, since the last time I backpacked was 10+ years ago with a 50 lb pack and I need to repurchase practically everything. Hard to go on the cheap when lightweight gear practically costs your first born. Gotcha, and I know what you mean! As long as you are using a chemical treatment with it, the FP will work great. And I did not set it up in line, but rather just screwed it to the top of my Platy bottle and let it flow through the filter. The biggest thing here is to make sure that the thread pitch on the dirty bottle matches the thread pitch on the filter, this way no water will drip between the 2 and into your filtered water. Hope this helps, and good luck with getting your gear together! I consider mileage to this extent: either I am going on that hike or not. I don’t consider the mileage once I am hiking. I guess I am saying, I smell the flowers. I stop to camp, or not, as suits me. I stargaze. I look at the water features, sitting enjoying the fresh cool air. I am a social person, for the most part enjoying the appearance of other hikers or campers. But you are a family man. That may make loneliness and homesickness an issue. 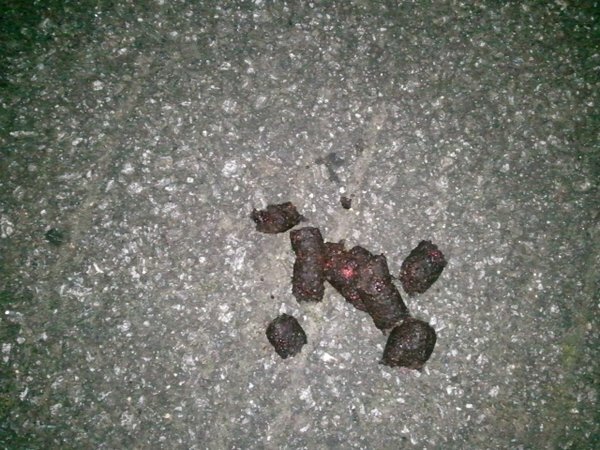 I know some hikers who send messages with their SPOT. I know hikers who phone home. I have even seen horse-outfit campers with rented satellite telephones. Maybe some combination of tracking and journaling online may make you feel more in touch with loved ones while hiking out for longer amounts of time and distance. Maybe short hike in and camp with family may help. As far as mileage, that is something that I tend to figure before the hike. The same as I/we did on this hike. However, due to Joe being so sick, we could not finish the mileage that we had planned. As far as stopping to camp or not, as suits me, this depends on where I am going. 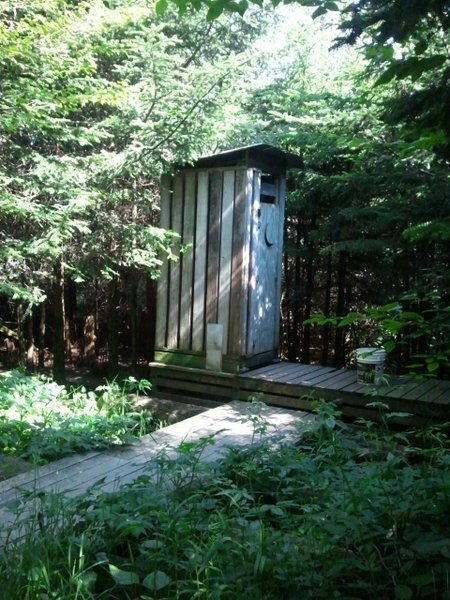 Of course, being in a park such as the Smokies, this is not an option. There is absolutely designated stops that must be made, due to the rules of the park. However, on other parts of the AT, it is not so much this way. On these parts we can always stop where we want, when we want. I do agree with the family man bit, and while I am usually fine during the day time, I find that as night rolls around, I am quite homesick, and miss the presence of my family. This, I believe, would be the hardest part of me accomplishing an AT thru hike at the moment, and is why I am not making plans to attempt one. 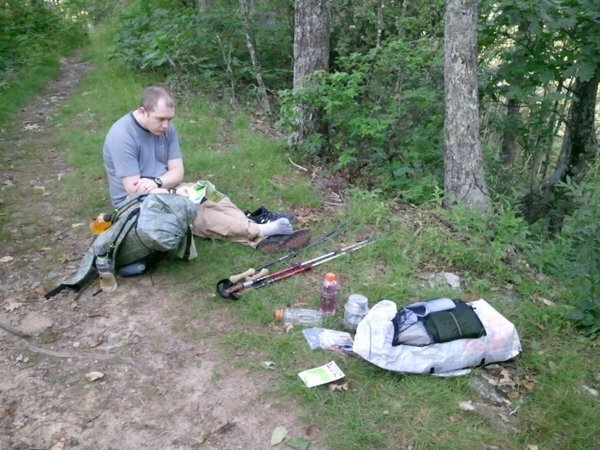 A thru hike encompasses a lot of planning and preparation before hand. And until I am a bit more confident in my abilities to get away without being quite so homesick, I am not prepared to make that kind of effort. Glacier National Park, MT is like that: one night at each reserved designated campsite. Actually, you are quite good at orienteering because you had looked at the bigger maps, and, because you had alternate exits. That is good planning. 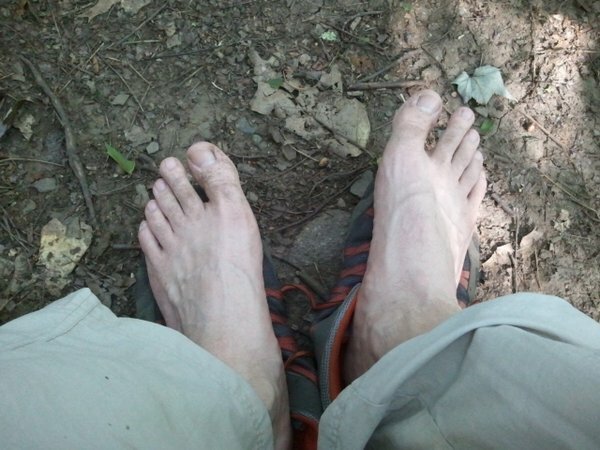 After commenting, I was thinking more about Appalachian Trail thru-hikers and having long mileage days. I have done long mileage days. There is some terrain I do not find interesting: I am eager to get a move on. I once read about an interesting supported hike. This man hiked the entire Appalachian Trail. His wife made the road trip. She met him at trailheads, they had “zero” days together (not too many) and he got resupplied. In many ways, he got to experience the trail more and not the road walking to and from towns, or having to hitchhike to and from towns. 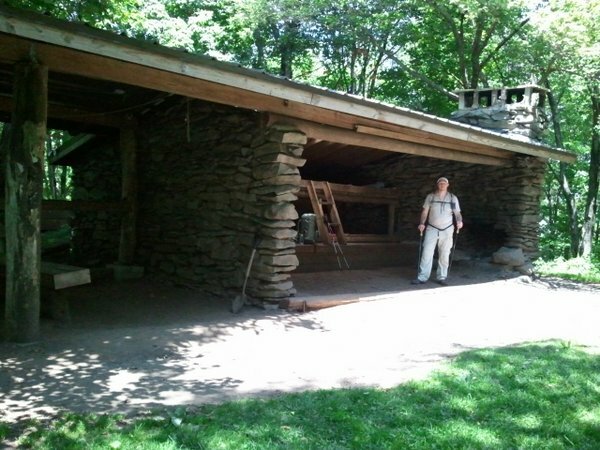 If your aim is an AT thru-hike or adding up sections for section hiking the AT, maybe it can be a road trip for your wife or for the rest of the family, if no grandparents are availble for having children for the summer. As far as the Squeeze system, I absolutely love it. But, as you found out, filling the bags are not the easiest unless there is some flowing water. And yes, I use a 1 gallon Ziploc bag to fill my Sawyer bag. I keep an extra 1 gallon Ziploc outside my pack that can be used as a stuff sack should it start raining, or to help with collecting water in times like these. How much different is the sawyer squeeze than the aquamira frontier pro? I was planning on picking up a frontier pro for my smokey mountain hike in october. Im planning on doing the whole AT section as well, but at a more moderate pace. Its cheap, and I know I can make something similar to the ‘squeeze’ or at least a gravity filter out of it. Thanks for your input! There is a huge difference between the Squeeze and the Frontier Pro. The Frontier Pro will only filter down to 3 microns. This means, the FP filter will only remove Crypto and Giardia, and nothing else. I used the FP filter in conjunction with chemicals, and only sometimes. Before I started using my Squeeze, I would simply treat my water with chemicals. If the water looked bad I would also filter the water through the filter after treating with chemicals. The chemicals will kill everything (viruses included) in 20 minutes except Crypto and Giardia. So, I would treat my water for at least 20 minutes, and then run it through the FP filter. This combination would result in purified water. The Squeeze on the other hand is like most of the other popular filters (such as the Katadyn Hiker Pro, the MSR Sweetwater, and others similar to these). The Squeeze will filter down to 0.1 microns, which will remove all the bacteria out of the water, but being that viruses are smaller than 0.1 micron, it will not catch the viruses. However, in the States, viruses are not such an issue like they are in some other countries. So, it is quite safe to use this filter on it’s own, with no other means of treatment. So, if you are getting the FP filter, I would highly suggest to get some sort of chemical treatment to use with it. Otherwise, if you want a filter only, I highly suggest the Squeeze system. If you want the one-stop-shop, then look at the First Need Water Purifier. This will stop all bacteria and all viruses at once. However, it is more expensive than the other 2 options (initially) and also weighs much more. I just wanted to say thanks for all the great information in your blog and video posts. You and several others have helped me reduce my pack weight a lot to a level that my back will allow me to enjoy myself out on the trail. To comment on your right of way thoughts, I tend to disagree with you. Personally, when I am going up a long up hill climb I have sort of a routine I get into. When I first start the uphill my breathing increases and finally levels out to where my breathing matches my pace, I think usually I fall into a breath in for two steps and breath out for two steps. This allows me to slow my breathing and I fall into a good steady pace without feeling like I’m gasping. I find that I can tackle long up hill sections with very few breaks. This leads me to my opinion on right of way. He last thing I want is for someone coasting downhill under gravity power to throw me off my stride. 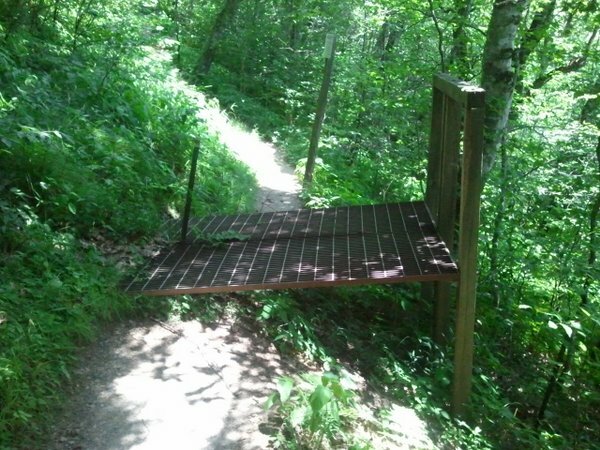 I personally think it would be much more polite for the downhill hiker to give right of way. Love your videos and all your insight. Thanks Darren. Glad that my blog posts and videos could be of some value to you! I agree with your idea of the routine that you get into when going uphill. I have come to slow my pace down and get everything into sync more which allows me to have a slow, but steady climb. Good point! Thanks for sharing. Glad you made it back safe Stick. I hope you and Gizmo get another chance to make the hike. My daughter and I are going to hike from Winding Stair Gap to NewFound Gap 1st week of August. Sounds like there was plenty of water available on the trail. I’ll be trying out my squeeze filter for the first time. I have had the same problem with the white blazes on the trail. Hate to backtrack to look for a blaze. Do you still carry your Mora Knife? We are actually going to be back out next weekend! However, this time we are doing NOC to Fontana! As far as the water, it was actually pretty dried up. The only water we came across was at the shelters, and Silers Bald was pretty much a few small puddles. At one point there were some some small streams crossing the trail when I did the section between Clingman’s and Newfound. And I really do love my squeeze. As I mentioned, it may be tough to fill the bottles when there are just puddles, but I just scoop water with a Ziploc and pour it from the Ziploc into the Sawyer bag. I have been doing this for a while though since my spare bottle of choice was the 2L Platy soft bottles before going to the Squeeze system. Anyway, good luck on your hike! We have a different hiking style: I look at the mileage the first time I look at the map. Either I am going on the hike, or not. That’s it. The other thing is you have family and friends (like Joe) to consider. I hike solo. Once I got over all the reluctance to hike solo, I love it. You also show the importance of navigating the trail. I don’t know if GSMNP has the side trails and animal trails that look like the trail, like we do. If it does, it is all the more important to have route finding skills. It is also surprising, to me, that map isn’t more accurate. I use 7.5 series topographic maps. I used to purchase quadrangles of the topographic maps. It seemed the places I wanted to hike always needed four or more maps. Next, I purchased custom topographic maps printed out at REI. Now, I have the National Geographic TOPO! Series state map CD for my state and, in addition, for some national parks. I print out the map I need. As far as the maps I have been using on my AT hikes, they are not topo maps. Check out the 3rd video towards the end to see what I am using. There are a number of side trails that veer off the AT and for the trails are pretty clearly distinguished. 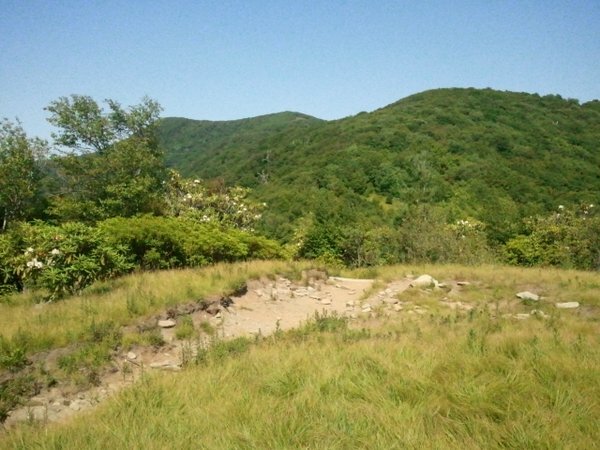 However, some are not so much, and as I have found on numerous sections of the AT, there tends to be times where the trail does not have a white blaze for quite a while. Not sure if they have simply worn away or what, but there are sections without them. However, for this, I have come to the conclusion that I do not need a highly detailed topo map if I am planing to hike the AT only, and prefer to carry these profile maps instead. Of course though, I have found some discrepancies with them, but for the most part, they are pretty good. Before leaving for a trip though I will look at my larger scale NG TI maps to get an idea of side trails, or bail out plans and make note of them. Stick, thanks so much for sharing. I always take away something on your hikes and means a lot to me that you take the time to shoot video. Plus the fact that you take some awsome pictures. Guess you learned to stick a baggie in your pocket when going for water. That’s the only down side I have found using the Sawyer, but small price to pay. I cut the top off my 1 liter bag to use as a scoop. Hope Joe is feeling better and sorry you guys had to call it short but ya’ll done good and like you said, you got a few more miles in on the A T…….that’s always a good thing. Thanks Jim for the kind words and glad to hear that you can actually take something from my efforts! That is great to hear. You know, I actually thought about grabbing my Ziploc before heading down that hill, but for some reason I decided against it… so yep, lesson learned there… 🙂 But yes, I have really come to love the Sawyer Squeeze, and I must say that my tabs will again become only a back-up… As far as filling the small mount bags, as it sounds you have, I have also become quite comfy with filling it. I had used the small mouth Platy bottles for a year or so before going to this, so I was already used to using these types of bottles so it wasn’t a big transition for me. Hate that things didn’t work out as planned, but overall sounds like you had a good time. What was wrong with Joe, just a stomach bug?